BRAUN Strowman is reportedly in big trouble backstage with WWE owner Vince McMahon and the company's management. The Monster Among Men, who stands 203cm, has allegedly had a series of run-ins with top brass - with insiders saying he is "his own worst enemy." Strowman, 35, is one of the biggest stars on the roster and has enjoyed a huge push into the Universal Title picture over the past 18 months. Many expected him to win the title at last week's Crown Jewel pay-per-view but were left shocked when he lost an extremely quick match to Brock Lesnar for the belt. The apparent reluctance to make the 175kg giant WWE's top man have left many baffled, but PW Insider's Mike Johnson claims it is because of major "heat" backstage. Four different sources confirmed Strowman is in hot water after developing a reputation for arriving late and leaving shows early. "There are times where Strowman is negligent when it comes to showing up on time," Johnson said. "Sometimes he makes mistakes in terms of etiquette in the backstage in the locker room. "Sometimes, as one person put it, he's his own worst enemy and his worst advocate. "They would be high on him and just when he gets to the point where you would think the next step is putting him into the centrepiece position for the company (then) something happens and he makes some sort of misstep backstage and people within management kind of cool on him and they take a step back." This year's Money in the Bank winner was a professional strong man before joining WWE in 2013. He debuted as part of the Wyatt Family but has come into his own since going alone as a singles competitor. 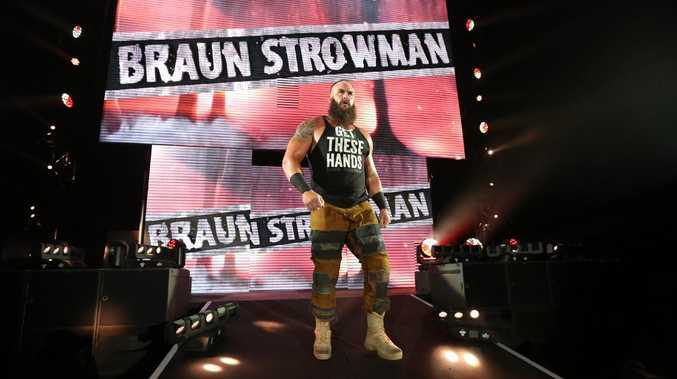 Strowman is also believed to be having serious injury troubles, with Dave Meltzer claiming his "knees are shot". It's prompted the company to offer a new contract to Lesnar, despite his plans to revive his UFC career. Meltzer has claimed the six-time world champ has agreed a deal to wrestle at least two more matches for the WWE. Already scheduled to fight WWE Champion AJ Styles at Survivor Series on November 18 at the Staples Centre, Lesnar is now expected to appear at WrestleMania next year. "The new deal is for multiple shows, but its length of time has been kept secretive," Meltzer reports. "But it is known that Lesnar is scheduled as late as April of next year for WrestleMania." The report claims the contract, which was signed last week, allows Lesnar to return to the UFC next year. It gives Lesnar control of the main storylines of both fight promotions. The WWE needs him for a main event title match at WrestleMania 35, booked for MetLife Stadium in New Jersey in April. The UFC needs him for a dream heavyweight title showdown with dual-division champion Daniel Cormier.